Alaska's boreal forest is home to thousands of people. 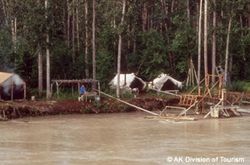 Living in remote homesteads, fish camps, and villages, as well as larger communities such as Fairbanks, they all carry out their lives in direct connection with the trees, plants, animals, and waters of the boreal forest ecosystem. Tourism brings hundreds of thousands of visitors to Alaska's interior each year. In addition, products from the forest and land of Alaska's interior-wood, berries, furs, and minerals-are exported around the world. The health of the boreal forest is a global issue. As we develop towns and roads in forested areas, we increase the likelihood of human-caused fires. To protect our lives and property, we also selectively suppress fires (both human-caused and natural) around settlements. This may decrease forest diversity around human habitations, thus decreasing wildlife populations available for viewing and hunting. Part of modern forest management includes "fuels reduction" projects near communities to reduce risk of wildland fire by maintaining early-successional shrubs and deciduous forest. This habitat also benefits many wildlife species. Permafrost is maintained by a delicate thermal balance. Development activities that disrupt the insulating vegetation layer over permafrost can can cause cause the frozen layer to melt and the ground above to collapse-a hazard called "thermokarst slumping." On a more global scale, large-scale permafrost melting throughout the world's boreal regions has started to cause concern. Scientists continue to search for the reasons behind the global warming that's causing the permafrost loss. Over the centuries, the Athabaskans of Alaska's Interior developed ingenious ways to prosper in the boreal forest: they developed a deep understanding of the medicinal and edible plants of the region, used their knowledge of the properties of snow, fur, moss, hides, and other natural materials to keep warm and safe in the winter, and accumulated wisdom about the habits and movements of game animals. Today, many Alaska Natives continue to maintain their ties to the forest; they fish, hunt, and gather edible and medicinal plants.